It has been quite a hectic month in politics, what with unemployment numbers, the mini-budget, Julius Malema’s calls for nationalisation and the intense debate on whether Cosatu/Ebrahim Patel/SACP has swung the ANC to the left. It all forms part of the same mosaic. The unemployment numbers were a real shock: 484 000 jobs lost in the third quarter of 2009 alone. Add that to the 475 000 in the first six months of the year and one ends up with a whopping 959 000 (almost 1 million) for 2009 to date! At its high point in December 2008, the country employed a total of 13,8 million people. After this year’s 1 million loss, employment has declined by 7% to 12,8 million people. One million consumers lost to the economy and one million times three or four people closer to poverty. The magnitude of what has happened this year (and it is of course not over yet) can be appreciated if we remember that in the four years before the global recession struck, SA created 500 000 jobs per annum. At that rate, unemployment could have been rolled back decisively by 2014. No chance now. By 2014 we will probably only be back to where we were in 2008. Consider the following numbers. then we can create about 280 000 jobs per year. It will then take three and a half to four years to make up the 1 million jobs lost so far. 280 000 jobs per annum is barely sufficient to keep up with the growth in the 15 – 64 working age population. Since 2004 that cohort has grown by more than 430 000 p.a. according to Labour Force Surveys and census numbers. If we assume that 70% of all these newcomers into the above age cohort, will be looking for jobs (a generous assumption), it means we need about 300 000 jobs per year. So, at 3% growth, we can just about keep pace with population growth, but we certainly cannot dent unemployment. There are now more than 4 million people unemployed, which explains a lot of the poverty and social tension we have in SA. To dent unemployment, SA needs 5% growth. Then 500 000 jobs will be created per year. That will be enough to keep pace with the growth in the working age population AND cut the unemployment rate in half within ten years. The 2% increase in growth makes all the difference!! It is true what Einstein said: the power of compounding is the strongest force in the universe. However, most economists would agree that SA’s growth rate potential is closer to 3,5%. To move from 3,5% to 5% growth would require considerable political will and vision around the economy. And that takes us straight back to politics. Apart from growth, what other levers can government pull to affect unemployment? Here, the public works programme, which we have discussed before in these pages, takes centre stage. It is SA’s version of the public works programmes run in the US, during the Great Depression. It was launched in 2004 and the aim was to create 1 million “job opportunities” in five years. In fact, the target was exceeded and 1,65 million job opportunities were created by March 2009. These are temporary jobs, mostly characterised by low productivity and low pay, and should be seen more as poverty relief and an opportunity to learn some skills, than real job creation. Hence the term “job opportunity” as opposed to a “real job”. During the last fiscal year, for example, public works programmes in the transport/construction sector created 6,2 million people days of work. That translated into 79 000 people having worked for 70 days – about 4 months. A second phase of the EPWP has been launched by President Zuma. More funds were allocated and the programme was upscaled. Now the aim is to create 4,5 million job opportunities during this term of government. Given the experience gained, lessons learnt and extra money allocated, this number could be achieved. However, do not confuse these “job opportunities” with “real jobs”. We will have to watch this space and see what comes out in the February budget and ministers’ subsequent budget votes. Our labour market co-efficient should be 1,0 – for every 1% growth, jobs should also grow at 1%. However, less rigidity is not on the table. It could not be realized during the Mbeki years, and it will certainly not be realized under President Zuma’s administration. We will have to make do with a co-efficient of 0,75 or thereabouts. Cosatu supporters would argue that the mere fact of 1 million job losses in 9 months is abundant evidence that SA’s labour market is very flexible. However, it is not the ease of job losses that count, but the ease of job creation. Are employers willing to run the gauntlet of labour laws and take people on? Evidence from employers suggest not. Biased evidence? Perhaps, but they are the ones creating the jobs, so why not take their opinions seriously? In our May presentations to clients we expressed our concern that the new cabinet was deeply divided on economic policy and that the price we would pay would be slower growth. We expressed the same concern in the Newsletter of that month (“Democracy meets economic policy-making”). Since May the divisions have become quite apparent. For the time being I am much less concerned about a swing to the left than I am about paralysis and gridlock. I also buy Pres Zuma’s argument that cabinet, and not one minister, is going to determine policy. President Zuma has effectively rebuffed Cosatu’s claim that Mr Patel must decide economic policy. But given that cabinet is divided, can it take the bold decisions needed for growth? Add to this the fact that our political focus is on jobs. But jobs cannot come without growth. We are focusing on the results we want (jobs) and not the mechanism to get it (growth). China and Vietnam, for example, do have a focus on growth, but our body-politic is simply not there, at least not yet. Mr Trevor Manuel’s role in planning and his envisaged Planning Commission can help with a better focus, but that clarity has not yet emerged. In May we hung our hat on an average 3% growth rate for the next few years (which means some years it will be 2% and some years 4%). It was instructive to observe that Minister Gordhan’s growth assumptions in his mini-budget came to an average of 2,5% for the next three years – rising from 1,5% next year to 3,2% in 2012. Mr Julius Malema’s calls for nationalisation are a further example of “democracy meeting economic policy-making”. No doubt he represents the views of many people in this country; and equally without doubt, those views arise partly from the crushing unemployment and poverty that confronts Mr Malema daily. In communities where unemployment is running at 70%, nationalisation must seem like manna from heaven. Those views are now being given space for the first time. In 1992 Mr Mandela simply told the ANC to take nationalisation off the table after a visit to Davos. The cold consequences of such a policy were spelt out to him in the snow of the Alpine mountains. After him Mr Mbeki kept nationalisation off the table. The party obliged both of them. But now the ANC is in a much more open and challenging mood and so the theme of nationalisation is raising its head again. Of course, many in the ANC are against nationalisation. Support for the idea is by no means a one-way street and as Mr Phosa has pointed out, it is not official ANC policy. But the remarks add to confusion. • We suffered a serious set-back on unemployment, exacerbating the crushing pressure from poverty and the hopelessness of not finding a job. 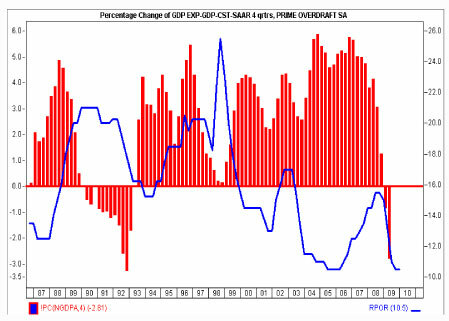 • Politically & economically speaking, the risk of slow growth is now higher than at any point since 1994. Not because of a swing to the left, but because the foot (of political focus and will) has been taken off the accelerator (of economic growth). • 2,5% to 3% looks like our growth range for the next few years. That is comfortably more than population growth, and thus we will keep getting richer. Per capita incomes will rise, jobs will be created and more resources will become available. 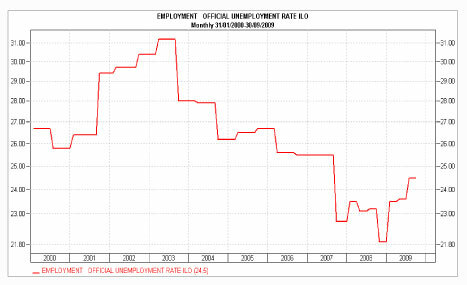 • However, not enough jobs will be created to bring unemployment down meaningfully. • To break the back of unemployment will require 5% growth. At the moment politics are not lined up to deliver that. • The Public Works Programme is a stop-gap measure. China is already our biggest export client. If they keep taking more of what we produce, we might have a “windfall” that will give us growth, whether we focus on it or not. 2010 will be an interesting year.